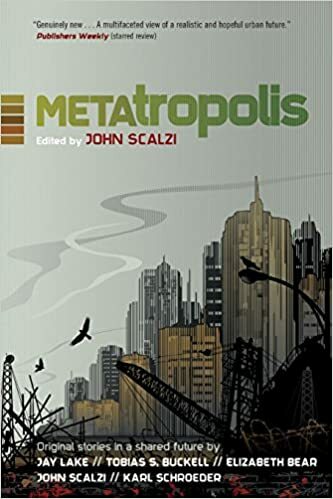 More than an anthology, Metatropolis is the brainchild of five of science fiction's hottest writers―Elizabeth Bear, Tobias Buckell, Jay Lake, Karl Schroeder, and project editor John Scalzi―-who combined their talents to build a new urban future, and then wrote their own stories in this collectively-constructed world. The results are individual glimpses of a shared vision, and a reading experience unlike any you've had before. A strange man comes to an even stranger encampment...a bouncer becomes the linchpin of an unexpected urban movement...a courier on the run has to decide who to trust in a dangerous city...a slacker in a "zero-footprint" town gets a most unusual new job...and a weapons investigator uses his skills to discover a metropolis hidden right in front of his eyes. Welcome to the future of cities. Welcome to Metatropolis.